Saint Louis – May 5, 2011 – Perficient, Inc. (NASDAQ: PRFT), a leading information technology consulting firm serving Global 2000 and other large enterprise customers throughout North America, today reported financial results for the quarter ended March 31, 2011. Since the stock repurchase program’s inception in 2008, the Company has repurchased 6.3 million shares at a cost of $44.6 million. On May 3, 2011, the Company’s Board of Directors authorized the repurchase of up to an additional $10.0 million of our common stock for a total repurchase program of $60.0 million and extended the share repurchase program to June 30, 2012. -- Completed the acquisition of Exervio, Inc., a Charlotte-based business and management consulting firm focused on program and project management, process improvement, and data/business analytics with approximately $13 million in annual revenues. 2011 guidance represents growth of 17% over second quarter 2010 revenue. The company is raising its full year 2011 revenue guidance to a range of $245 million to $265 million from the previously provided range of $235 million to $255 million. The company is raising its full year Non-GAAP earnings per share guidance to a range of $0.73 to $0.83 from the previously provided range of $0.70 to $0.80. Perficient will host a conference call regarding first quarter 2011 financial results today at 10:00 a.m. Eastern. Perficient is a leading information technology consulting firm serving Global 2000 and enterprise customers throughout North America. Perficient’s professionals serve clients from a network of offices across North America and three offshore locations, in Eastern Europe, India, and China. Perficient helps clients use Internet-based technologies to improve productivity and competitiveness, strengthen relationships with customers, suppliers and partners, and reduce information technology costs. Perficient, traded on the Nasdaq Global Select Market(SM), is a member of the Russell 2000® index and the S&P SmallCap 600 index. Perficient is an award-winning “Premier Level” IBM business partner, a TeamTIBCO partner, a Microsoft National Systems Integrator and Gold Certified Partner, a Documentum Select Services Team Partner, and an Oracle Certified Partner. For more information, please visit www.perficient.com. Some of the statements contained in this news release that are not purely historical statements discuss future expectations or state other forward-looking information related to financial results and business outlook for 2011. Those statements are subject to known and unknown risks, uncertainties and other factors that could cause the actual results to differ materially from those contemplated by the statements. The “forward-looking” information is based on management’s current intent, belief, expectations, estimates, and projections regarding our company and our industry. You should be aware that those statements only reflect our predictions. Actual events or results may differ substantially. Important factors that could cause our actual results to be materially different from the forward-looking statements are disclosed under the heading “Risk Factors” in our annual report on Form 10-K for the year ended December 31, 2010 and our quarterly report on Form 10-Q for the quarter ended March 31, 2011. Although we believe that the expectations reflected in the forward-looking statements are reasonable, we cannot guarantee future results, levels of activity, performance, or achievements. This cautionary statement is provided pursuant to Section 27A of the Securities Act of 1933 and Section 21E of the Securities Exchange Act of 1934. The forward-looking statements in this release are made only as of the date hereof and we undertake no obligation to update publicly any forward-looking statement for any reason, even if new information becomes available or other events occur in the future. 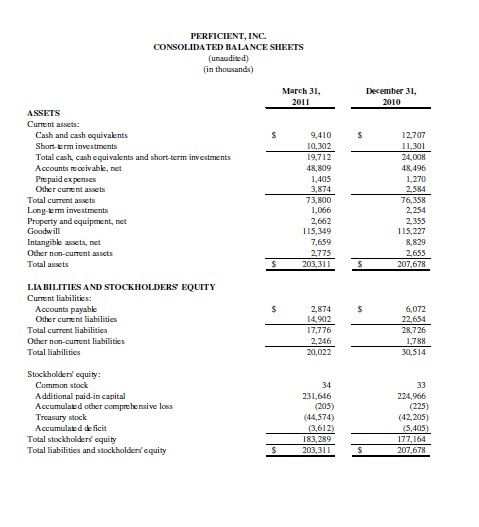 Perficient, Inc. (“Perficient”) provides non-GAAP measures for EBITDAS (earnings before interest, income taxes, depreciation, amortization, and stock compensation), net income, and net income per share data as supplemental information regarding Perficient’s business performance. Perficient believes that these non-GAAP financial measures are useful to investors because they provide investors with a better understanding of Perficient’s past financial performance and future results. Perficient’s management uses these non-GAAP financial measures when it internally evaluates the performance of Perficient’s business and makes operating decisions, including internal operating budgeting, performance measurement, and the calculation of bonuses and discretionary compensation. Management excludes stock-based compensation related to employee stock options and restricted stock awards, the amortization of intangible assets, acquisition costs, adjustments to the fair value of contingent consideration, and income tax effects of the foregoing, when making operational decisions. Perficient believes that providing the non-GAAP measures to its investors is useful because it allows investors to evaluate Perficient’s performance using the same methodology and information used by Perficient’s management. 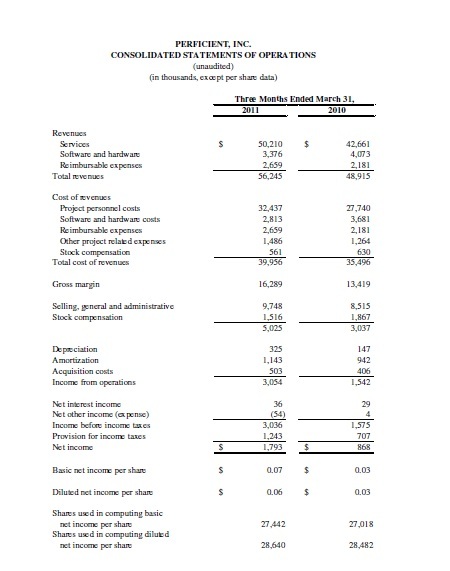 Specifically, non-GAAP net income is used by management primarily to review business performance and determine performance based incentive compensation for executives and other employees. Management uses EBITDAS to measure operating profitability, evaluate trends, and make strategic business decisions. Non-GAAP measures are subject to inherent limitations because they do not include all of the expenses included under GAAP and because they involve the exercise of discretionary judgment as to which charges are excluded from the non-GAAP financial measure. However, Perficient’s management compensates for these limitations by providing the relevant disclosure of the items excluded in the calculation of EBITDAS, non-GAAP net income, and adjusted net income per share. In addition, some items that are excluded from non-GAAP net income and adjusted earnings per share can have a material impact on cash. Management compensates for these limitations by evaluating the non-GAAP measure together with the most directly comparable GAAP measure. Perficient has historically provided non-GAAP measures to the investment community as a supplement to its GAAP results to enable investors to evaluate Perficient’s business performance in the way that management does. 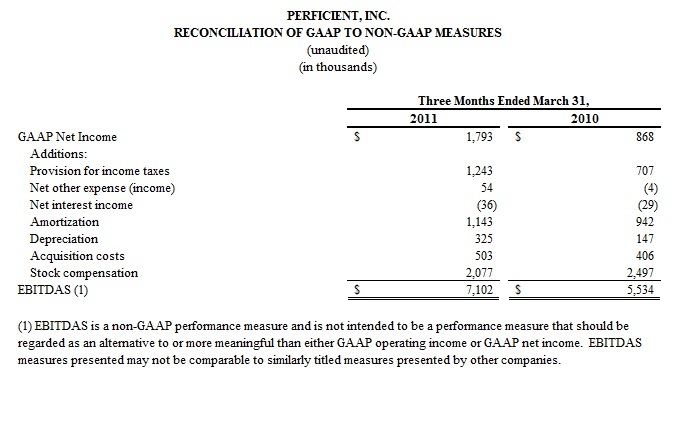 Perficient’s definition may be different from similar non-GAAP measures used by other companies and/or analysts. Perficient has incurred expense on amortization of intangible assets primarily related to various acquisitions. Management excludes these items for the purposes of calculating EBITDAS, non-GAAP net income, and adjusted net income per share. 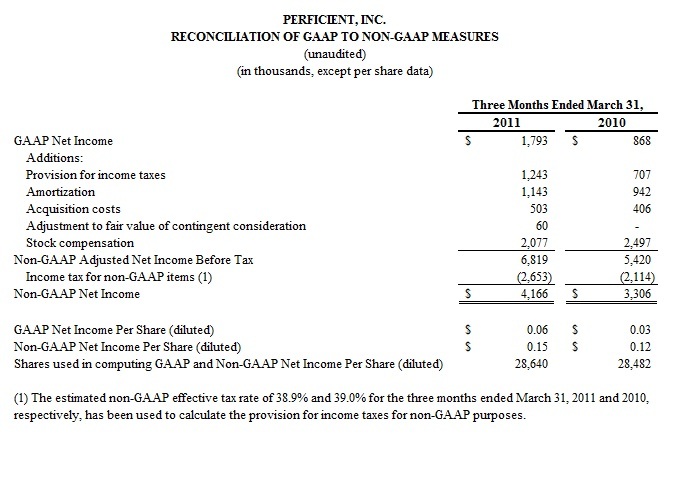 Perficient believes that eliminating this expense from its non-GAAP measures is useful to investors because the amortization of intangible assets can be inconsistent in amount and frequency, and is significantly impacted by the timing and magnitude of Perficient’s acquisition transactions, which also vary substantially in frequency from period to period. Perficient incurs transaction costs related to acquisitions which are expensed in its GAAP financial statements. Management excludes these items for the purposes of calculating EBITDAS, non-GAAP net income, and adjusted net income per share. Perficient believes that excluding these expenses from its non-GAAP measures is useful to investors because these are expenses associated with each transaction, and are inconsistent in amount and frequency causing comparison of current and historical financial results to be difficult. Perficient is required to remeasure its contingent consideration liability related to acquisitions each reporting period until the contingency is settled. Any changes in fair value are recognized in earnings. Management excludes these items for the purposes of calculating non-GAAP net income and adjusted net income per share. Perficient believes that excluding these adjustments from its non-GAAP measures is useful to investors because they are related to acquisitions, and are inconsistent in amount and frequency from period to period. Perficient incurs stock-based compensation expense under Financial Accounting Standards Board Accounting Standards Codification Topic 718, Compensation – Stock Compensation. Perficient excludes this item for the purposes of calculating EBITDAS, non-GAAP net income, and adjusted net income per share because it is a non-cash expense, which Perficient believes is not reflective of its business performance. The nature of stock-based compensation expense also makes it very difficult to estimate prospectively, since the expense will vary with changes in the stock price and market conditions at the time of new grants, varying valuation methodologies, subjective assumptions, and different award types, making the comparison of current results with forward looking guidance potentially difficult for investors to interpret. The tax effects of stock-based compensation expense may also vary significantly from period to period, without any change in underlying operational performance, thereby obscuring the underlying profitability of operations relative to prior periods. Perficient believes that non-GAAP measures of profitability, which exclude stock-based compensation are widely used by analysts and investors.